I came to Larsen Motorsports on a Friday afternoon to talk to the two-time National Jet Dragster Racing Champion, Elaine Larsen, and check out her shop. Well, it’s not a shop; it’s a showroom with an engine lab, body lab, massive jet engines, jet racing cars and trailers, awards, a dog and quite a few college kids working on different space-age projects. This is not what I expected from a racing team’s garage. I’m a Formula 1 fan, watched the Paris – Dakar rally, been to a few Nascar races, and love watching “Top Gear.” I’ve also seen garages up close and personal, but Larsen Motorsports is unlike anything I’d seen. It is more of a research facility than a racing car garage. Yes, you get all of the racing necessities like the enveloping jet fuel smell, the spare tires, the stacks upon stacks of car parts, the paint cans, the sponsors’ banners. Today they’re testing one of the new drivers, as she (yes, you read that right) is set to start up the jet car and take it through the pre-race paces, a mandatory step in the “How to Be a Jet Car Driver” course. We go outside to the parking lot/test area, and there’s this massive jet car waiting on the tarmac. As I converse with Elaine, out comes the 20-year-old driver-in-training, Kat, known as “K2,” all dressed up in the fire suppression suit (aka, racing suit) with the helmet under her arm. K2 was 18 when she first met Elaine. She kept calling and following up, kept coming to the lab, and now she’s learning to be a #jetgirl. She’s going to Florida Tech, studying multi-platform journalism with a focus on STEM education, all while working on her jet racing license. K2 is in the jet car and as she’s going through the paces, the audience grows. There’s a big group of people that just pulled in from the road, and you can’t blame them for watching. The car is jetting fire out its back, a sight rarely seen. She follows Elaine’s signals like the pro that she is, and the test is a success! K2 exits the car to cheers from a massive audience, sure to spend the rest of the day one cloud nine. K2 is part is of an equally unique and amazing group. The Larsen Racing Team is made up of seven drivers, SIX of which are women! Or maybe I should say girls, because they are barely out of high school. But that’s not what you see on the track. That’s not what you see in the garage. What you see is a level of professionalism that is near military perfection. The cars are built by Florida Tech students! The level of research and development that these college kids can do is unrivaled. Hands on experience in race car design is what they get, and making dreams come true is what Elaine Larsen does. Elaine Larsen: That’s exactly what I want people to think about when they think about Larsen Motorsport. We work with young kids, and we enable them to live their dream. TBM4W: How did you end up working with Florida Tech? Elaine Larsen: I’ve been racing cars for 20+ years, driving a jet for 15 years now. We were in it to win it. I wanted to win the prizes, I want to win the money, I wanted to be the best. Six years ago when I wrecked, I decided that being in it to win it had its ups and its downs. We were talking about Formula 1. You have to calculate the risks. I was calculating the risk, and the money that I was getting to win did not pay out. That wasn’t the end goal. As much as everybody’s there cheering you on in the stands when you’re hurt in the hospital, who’s there for you now? Who’s there to pay your bills now? Who’s there to help you walk and talk, and feed you and all that stuff? Nobody. And when you’re up to your eyeballs in hospital bills, who’s going to help you? You know? So we had to change our philosophy and do a little bit more with research and development. We wanted to do a lot more with education for high-performance vehicles. We knew that there was a need out there. So when Florida Tech said, ‘Hey! We’re interested. Can you come see what we do on our campuses?’ we knew we were a match. What the Space Coast does is exactly what Larsen Motorsports does. All of our cars are set to the same aerospace standards that an airplane would be, so we build our cars exactly like you would build an airplane. People don’t think about that when they think motor sports. ‘Oh, it’s not as high tech!’ I’m gonna tell you that our cars are just as high tech as any airplane is! We literally take an engine off an airplane and make it stay on the ground. So we reverse engineer. Instead of making it fly, we’re making it stay [on the ground], and stay stable. It’s fun and it’s interesting, and it’s a way for the kids to get great hands-on skills that they would never be able to get if they were to work for another company, because you have to prove yourself. TBM4W: You’ve been racing for 20 years. You have to love it. EL: I do. I love the game. I love pulling to the gates. I love looking at the atmosphere, I love watching the trucks and trailers pull in and watching the audience go up and watching the car get unloaded. That to me, gives me chills because there’s still something about it. I get just as much of a thrill as watching Kat [K2] take the accolade today, as I do for me. I can sit back and I can watch her come in. That girl is going to be walking on air for the next two weeks. That’s cool! Is it cool to be the one people are clapping for? Absolutely! I’m not ready to give that up yet. But it’s even better when you’ve helped be a part of making that happen. TBM4W: How are you managing that, having a mostly girl team? EL: We make it a very good environment for women to come feel like they can come in and ask (sic): ‘Hey, I’d like to be a driver.’ I get girls come up to me all the time saying: ‘I wanna drive a jet car.’ I look at them and say: ‘Why?’ ‘Cause I wanna go fast!’ ‘Ok! You’re going to the end of the line!’ [that’s race car jargon meaning, hell no!] Because that’s not at all why you want to do it! You wanna drive a jet car because you want to make a difference. You want to drive a jet car because you want to show what girls are capable of doing, or what people are capable of doing. You want to make a difference in the world. You want to help people get rid of their fears. I’ve had so many people email me and say (sic): ‘What would Elaine do in this situation?’ Elaine is not afraid to get back in the car after she’d wrecked. Yesterday I ran a 5K. I’ve haven’t ran 3 miles consecutively in 4 years. I ran it! Was it the best time? No! I ran it in 34 minutes, and I’m dang proud of that. [laugh] That’s not bad! I did not fall. I did not get lost. I did it. I mean it sounds silly, but common things like that are scary for me because I do such extremes, things that people take for granted. When I see people do that, I’m like Gosh, I wish I could do that! And I did it. I didn’t question it. I didn’t care what I looked like. I went out there, probably ran like a spaz, but I didn’t care. But getting girls to come in is huge. I can get the girls to come in, but finding the right girls – that girl that has the spark, that girl that wants to give and not take. Now I’m a little tougher when it comes to recruiting; it’s not as easy as it used to be. I’ve taken a few knocks, and now I can smell it. I like shoulders back, head up, but don’t kick your head too far up. You know what I mean? TBM4W: It’s about courage, especially when you’re about to get into a car that’s got a jet engine strapped to it. But when it came time to flip that switch [getting in the car, and turning the jet engine on], SHE DID IT! Her hand was shaking, absolutely. And if it wasn’t shaking, I might have been thinking: Do you fully understand what you’re doing? TBM4W: What’s the process of getting the girls/potential drivers from when they meet you to today? EL: It depends on each girl, on each person. For some people it can go very quickly. For K2, it took her about 6 months. First, I had to make sure that she’s in it for the right thing, which she is. K2 will start getting her license by the end of this year (2016), and will be a fully licensed driver by the first of next year. Now she started the car. Now, how it’s going to be when she starts seeing speed? Is she going to be able to understand where she’s at on the track? That’s another thing. You can’t gauge that until you put them in the car, and put them on the track. On the track, there’s markers. There’s the 60 foot, 330, 660, 1000 foot, and then the full .25 mile, and there are boxes that give us increments. You gotta know where you’re at. Always. How many times do you get in your car, and find yourself somewhere else? Wait a minute, how did I get here? TBM4W: Being present is important, especially at those speeds. You guys are fast. 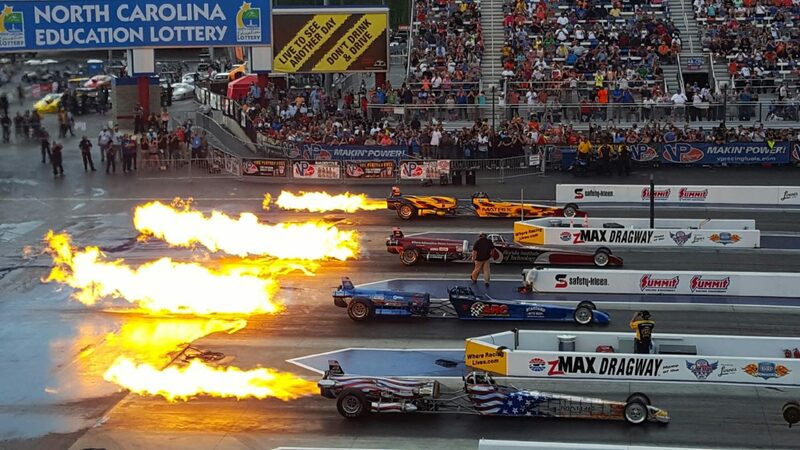 Race cars are fast, but this jet car is spectacularly fast. Seeing it blazing down the track is was so incredibly exhilarating, so loud, so quick, and all the senses were engaged. EL: And when they light the afterburners, and you’re there, [laugh]… I swear that there’s something! A lot of cars go down the track and people are like, cool, high five. But when a jet car goes down the track people laugh, people smile. There’s something about it that just makes people happy. Either that or you get the other reaction. My friend waits for me at the finish line and she just hates what I do. My friends and family are so ready for me to retire. They just want to know that come event weekend, I’m going to be safe. Every weekend they’re on stand by. Is Elaine racing? Where’s Elaine at? Do I have to think about it? And Chris [Elaine’s husband] always sends a group text out to everyone: “Elaine is safe.” But my one friend, she cries every time I go down the track. ‘I just don’t want you to do this anymore.’ I realize that it takes its toll. My son, it takes a huge toll on him. He’s ready for me to get out of the car. TBM4W: It’s dangerous. We’ve all seen the wrecks. Nobody wants to think about what could happen. But you have to think of it, every time you get into a car. That’s the biggest rub! You really have to be prepped for that. EL: You know that that could happen. I don’t know if K2 can know what is ahead of her and fully understand. I’ve had people literally die right in front of me in a wreck. Friends. Friends have died. My kid was playing with this guy’s kid 5 minutes before, and then his daddy died. And it’s heartbreaking. And you start thinking ‘I don’t want to get into the car.’ It’s hard. We do it because it’s not what we are, it’s who we are! A race car driver is not what I am, it’s who I am. I’m not a risk taker. I have never a had ticket. I have never been in jail. I’ve been pulled over a couple of times, but I’ve managed to talk my way out of them, but I’m not a risk taker! TBM4W: How can you say that, when you’re a jet car driver? EL: I calculate that risk. I calculate what I’m going to do, I know what’s going to happen, and every time that I get in that car, I think, ok, if I wreck, this is what I’m going to do. I think of all the scenarios. I walk the track, I look at the shutdown area. I take away all of the questionables that I possibly can, because there’s so many that you can’t possibly prepare for. So I’m trying to get at all the ones that I can prepare for, and get rid of them. This way, I’ll know what I’m going to do, so there’s not even a thought.…. TBM4W: Do you have a simulator? EL: At this point, the simulators just can’t account for that risk of death. The human factors are just not there in a simulator. The good news is that a simulator could prepare them, analytically, for the race. I see simulation in our future, very rapidly, like in 2017. We’re getting to the point where we’re training too many people. TBM4W: How long is the actual race? EL: Is so big! I think that it almost gets diluted with Nascar, Indy and Formula 1, because you couldn’t hold that sustained adrenaline. The fans can’t, and the driver can’t the entire time. Whereas ours [type of racing], is such HIT, and then it’s gone. Racing now has become such spec cars that it’s not as entertaining to me. What I like about jet cars is that it’s the true untouched racing. They don’t regulate us nearly as strictly as they do the other cars, and we’re able to do so much more as far as design-wise than any other cars. We’re not out there for competition to the other teams, and there’s not this huge group that goes and travels. We’re not this big segment [of racing]. TBM4W: Let’s talk about sponsorships. Is Florida Tech a sponsor? EL: We do a partnership with them, and that’s different than my sponsors, from Matrix and Valspar and sponsors like that. Most of my sponsors aren’t sponsors like you would normally see. I want a partnership with Florida Tech; we work with them on their research, so it’s a give and take. They may give us some of their research opportunities and access to some of the things that they have at the University and their knowledge and faculty, and things like that, and then we may give them student enrollment. Valspar Matrix, right now we have the composite lab that’s on that. US Chemical, they’re giving us the fiberglass we need. We get to call them and get their people come in and help the students understand composites. So it’s a true partnership. Trust me, I’d love for someone to come in and just write me a check, and say: ‘Here!’ But I found that when people don’t have an affiliation with what you do, that money is quickly (sic) come and gone. It’s easy for me to be a line item that gets crossed off. I don’t want to be a line item. I want to be Elaine Larsen! I want them to know who I am, and I want them to be invested into our company and I want to invest in their company. I invest in their company as much as they invest in mine. TBM4W: What is your involvement with STEM? EL: STEM wasn’t around when I was little. We didn’t say the word STEM, and it’s overused. I feel like what we need to know is what is the career that we like, so exposing people to different careers, and finding out how people got there. For me, that’s all business. To be a race car driver you have to be athletic, energetic, have a sound mind and be business savvy. But if you want to design race cars, if you like looking at the body shapes that they have on these new race cars, and you’re fascinated with why they did this and why they did that, like the new wing on the front of the Indy car, the one that shatters into a million pieces, if that fascinates you, then what does that mean? It means that you’re good in math, and you’re into aerodynamics, and this and that, and that’s what I’m trying to push. All this happens to fall into that STEM bucket. But I change it up a little bit with: Science, Technology, Engineering, ARTS and Mathematics. Engineers are really artists, because they build and design amazing things. Whether it’s civil engineering, space engineering, mechanical engineering – I think that anything they build can be a piece of art if you look at it the right way. And I think that you should take pride in that like it is art. We built Speedy the Scarecrow. I like taking things out of the garbage can, and making something new and fresh out of it. He’s built from scraps. It’s recycled. Chris and I were very poor when we got married. We both made $3.35/hour, each. My parents had money. His mom had money. That didn’t mean that we had money. Neither of them ever gave us a penny. Ever. There were times when we didn’t have heat for the house, food for the refrigerator. We did have our car, and the money to be able to get it fixed. We sucked it up. We did it. I’m glad that they didn’t give it to us. At the time, I wasn’t happy about it, but it made us better, so now we learned how to dumpster dive and get what we need and live on that. I can live on nothing if I had to. I have all this. But this can go away tomorrow, and I’d be fine. I would find something else. If this were taken away because of something catastrophic, I’d build something else up. TBM4W: To me that’s a definition of success. It doesn’t matter what you have and for how long you have it. If something massive like that happens, and you lose it all, if you can get up, that’s success. EL: When are we considered successful? When we have one team, two teams, three teams? When does it stop? Success today was looking out at K2 and seeing those guys go ‘Woohoo’ when she got out of the car. You can’t take that away. We did that. So, can I build that again? Abso-freaking-lutely, I can build that again! None of this counts, my house, my cars, my engines. I built it once, I’ll build it again. TBM4W: How do we get more girls into STEM? EL: By making this look accessible. Make it look attainable. Anybody can do what I do. I am not special. I am not the best race car driver out there. And if this is something that you truly want, you can do this too. That is the secret. Make it seem accessible to them. TBM4W: How do they (the drivers and the interns) come to you? EL: As an instance, we were at the Florida Tech homecoming last year, and I had a parent approach me and say: ‘My daughter, Emily, is a freshman at FIT, and she’s going to be a mechanical engineer. Tell me about the jet drag team. I want to see if this is something that she could be into.’ So I ask: ‘What is she into?’ ‘She really likes writing, she likes comic books’ and I said: ‘Oh my gosh, I have a comic book!’ So we’ve been keeping in touch, and when my comic book started to take off again, Emily reached out to me, and now she’s the author of my new comic book. TBM4W: When is that coming out? EL: I don’t know. I don’t want to set deadlines on that. 2017 at some point. We’re making the bios right now. We’re making what the girls are going to look like, what they act like, and yes, it’s a girl comic. It is. But we’re defining what people are going to read and think. It’s about people, real people, and it’s about what we do. Each one of the comics is bits and pieces of the kids that are in working here, which is hilarious. TBM4W: So every one of the girls in the comic will be in a STEM related field? EL: Within each comic, there’s going to be a lesson plan that the teachers can take back to the students. Now we’re working on this, and you know, it’s going to be set in space. Take the jet car. A jet engine needs air. The more air it gets, the faster it’s going to go. So there’s going to be issues with some of these areas where there might not be enough air to sufficiently run the engine. So how are we going to run around this obstacle? There’s going to be an engineering obstacle in every comic. Maybe there’s not going to be fuel, maybe we’re going to have to come up with a new type of bio-fuel plant based on plants in that area. Every comic is going to have a lesson plan. It won’t be weird, like the kids won’t want to read it. But at the end, they’d have realized that they’ve figured it out. Now, here’s the math behind how they did it. TBM4W: You’re not going to have math in the comic book, are you? EL: No! That would be boring. It’s going to be after the comic. But if you want to know more about Blaze, and how they got the engine to work, here’s the math behind it. That’s why I have a mechanical engineer writing my comic. TBM4W: Blaze is the name of the main character? 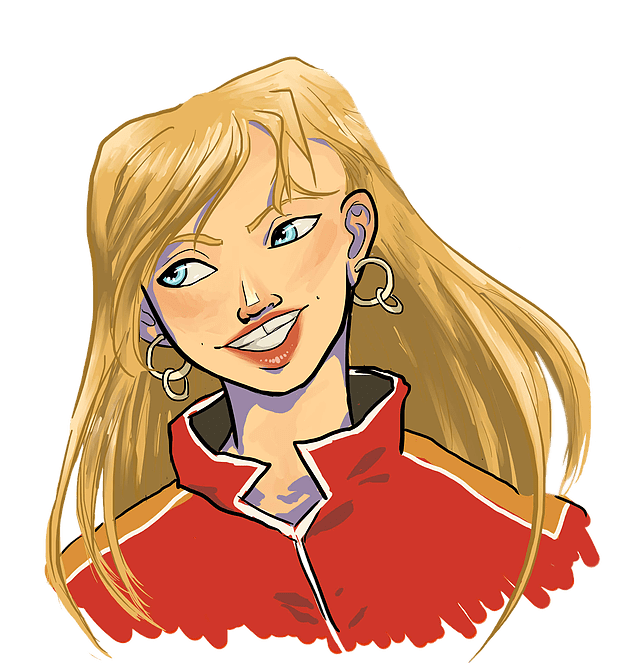 EL: Her name is Hailey Sparks, a.k.a., Blaze. She’s so fierce. She’s a young version of who I wish I was when I was that age. TBM4W: What’s next for Larsen Motorsports? EL: We’re partnering up with some different venues. We’re partnering up with NHRA, and they’ll bring high school students to the track and we’ll be able to have a broader impact on these kids, because we’ll be reaching to 12,000 kids just at the races, and these 12,000 kids are in STEM related curriculum. We’re going to need to amp our game up. That’s ok. We’re up for the challenge. We’re working on our new designs, that will be a big one. The new design cars that the Florida Tech kids have had a direct impact on making. Right now they’re doing the spinners for the parachute cans, and they’re building them. We’ve run the 5th generation car for a few years now, and we haven’t made any major modifications, but we’re going to take it, and we’re going to run real analyses on these cars. So it’s not going to be, ‘We think that it ran faster.’ We’re going to have some of the kids run the tests, and that’s going to be part of some of their thesis projects. Again, that’s the partnership with Florida Tech. What is that going to mean for us? Possibly faster cars. But it’s going to mean that we have data to push us forward to design cars for the 7th generation and 8th generation. We’re in partnership with Florida Tech, but this is a Larsen Motorsports initiative. We’re using the brain trust of the kids, which is an awesome part. Chris and I are the oldest people here at the shop. The next person up is 24, and that’s Brian, a graduate of FIT with an aerospace engineering degree, and he’s getting his MBA right now. Everybody else is under 24. They’re the ones driving the train. Chris and I are just funding it. They’re the ones in the driver’s seat. The main goal is that they’re really working on building this funny car. They’re excited. They’ve spoken, and we’ve listened. We have team meetings all the time, and we ask: What would you like to be our next challenge? And they say this, and this, and this. And we do what they say. I fly out to L.A. in November, and so Chris and I are going to take a few days and hangout. Life’s been pretty fast for us the last few years, and it’s nice that we’re taking a few moments to just smell the roses. We went to watch the sunrise the other day. We just take moments out for us, because we realize that if we don’t, before you know it, those moments are gone. Once a week we’re trying to take a moment just to enjoy what we’re working so hard to achieve. Sidenote: I went to a race day to watch Elaine and the team race and qualify for the nationals, before the interview, and she took me down to the starting lane. She gave me a set of noise canceling race headphones and plopped me at the starting line, before the lights, on the tarmac. The jet car pulled up, did the smoke and fire drill, and got aligned to the starting marker. Lights went from red to green, and the jet car punched through! It was like getting hit by a wall at 60 miles per hour. It was SO LOUD! Imagine having an airplane engine NEXT TO YOU, with no protection but a pair of headphones. The feeling was intense. It was loud, it was windy, it made my whole body shake. My shirt lifted from the intense air displacement. I was told to hold on to my hat, so that was still there, but barely. Intense. The video I took doesn’t do it justice.